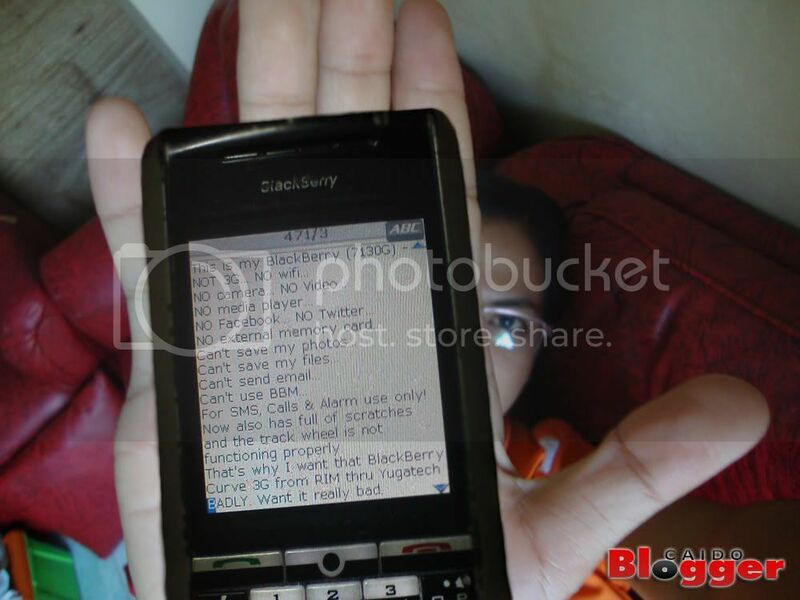 Meet by BlackBerry 7130G phone (please see photo above). It's been my buddy for about two and half (2 1/2) years now. It was actually lent to me by my older sister because she was not used to a QWERTY phone. This phone is not 3G and not wifi-enabled phone. It has no subscription of a data plan from Globe so I could not use its browser, email and BlackBerry Messenger. Since that's the case, so there's no Facebook or Twitter or Yugatech with this phone. :( It has no built-in camera so I could not take photos or videos with it. It has no media player either, can't play videos or my favorite mp3s. It has no external memory card so I could not save any files with it. But it is well-used for SMS, Calls and Alarm. And also for Notes. My BlackBerry has now many scratches and sometimes the track wheel on its side is not functioning properly. Why do I want that BlackBerry Curve 3G from RIM thru Yugatech? 1. All that my BlackBerry 7130g lacks, BlackBerry Curve 3G has! So I think it is the right time to upgrade it to a BlackBerry Curve 3G. How badly do I want the BlackBerry Curve 3G? This is my official entry to BlackBerry-Yugatech Give-away Contest.